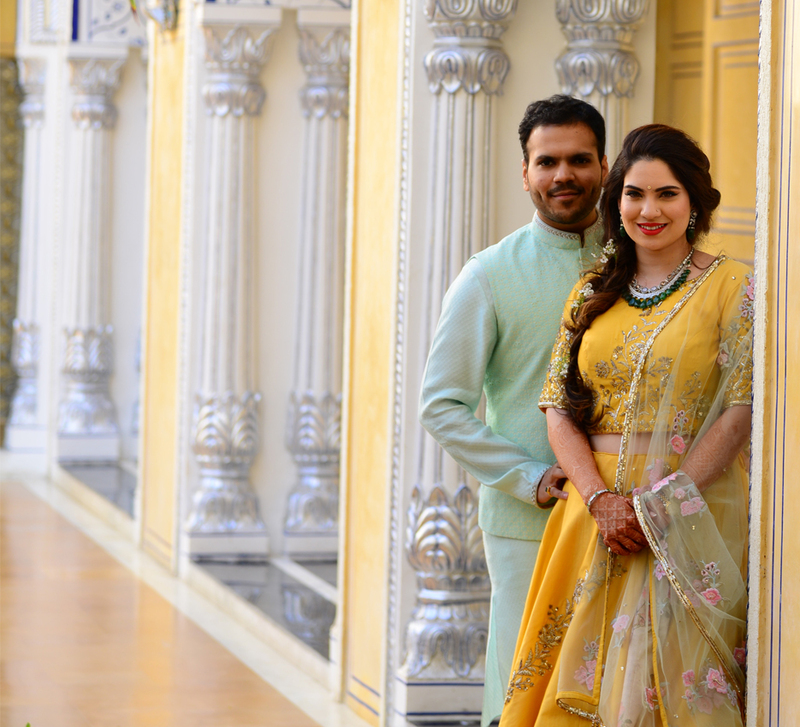 Instagram star Diipa Khosla and Diplomat Oleg.E.H.Buller wowed everyone with their stunning looks, decor and festivities at their traditional Indian wedding in Udaipur, Rajasthan. From an exquisite handmade wedding gown that went viral on social media to expertly curated events, there was no doubt that Instagram star Diipa Khosla's wedding would be a feast for the eyes. The celebrations that unfolded in the cosy yet royal Hotel Fateh Garh in Udaipur were curated with an expert's touch to look distinctive and original. Check out the highlights below. Diipa and Oleg first bumped into each other at a university where Oleg was the president of the student body and Diipa was a freshman who had just moved in from India. Oleg had to welcome new the students as part of his duties as a president. Little did he know that he was about to meet his soulmate Diipa there. Diipa shares, “Hotel Fateh Garh is a regal yet cozy property with 47 rooms. We booked out the entire hotel for our guests. We kept the invitee list to just 100 of our near and dear ones." 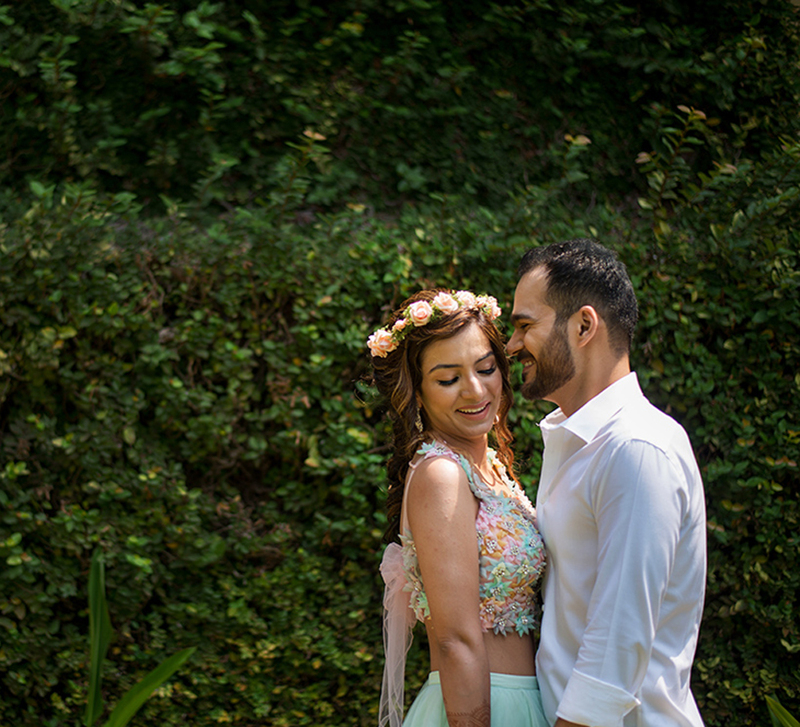 The picture-perfect wedding was captured by Zohaib Ali Photography and diligently planned by the couple that included an array of interesting activities and themes to match the luxurious venue. This gave their international guests an exceptional experience of the rich traditions and culture of Rajasthan. The wedding included collaborations with Jo Malone London, Estée Lauder, Clinique, MAC Cosmetics, Jimmy Choo, Laurent Perrier Champagne and custom-made wedding dresses from Sabyasachi Mukherjee, Abu Jani Sandeep Khosla, Anamika Khanna, Ashi Studio, and more. MAC Cosmetics’ makeup expert Nisha Sirpal created unique looks for Diipa for the various events that took place over four days. Celebrity hairstylist Aamir Naveed from Aveda designed intricate hair looks for each occasion. The celebrations commenced with the mehndi function. For this function, Diipa went for a hairstyle that epitomized old-school Bollywood glamor with a faux fringe. She wore a Sabyasachi saree with floral motifs which she paired with a glittery blouse. Oleg donned a Varun Bahl ensemble that featured elegant pink motifs on a white sherwani as well as a stole with a decorated border. For the sangeet, Diipa picked a custom-made onion pink Anamika Khanna outfit that was resplendent with rich yet delicate embroidery. The ensemble included a sleeveless blouse, skirt and trousers as well as a matching stole. 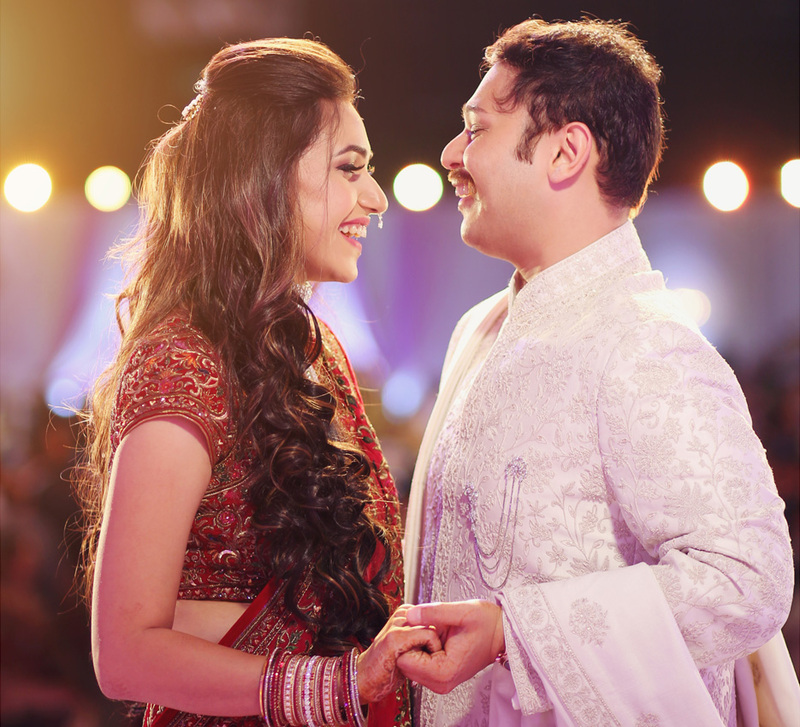 The couple’s elegant entry at the sangeet impressed all. The haldi function took place on the next day, and Diipa shared that it was her favorite event on her Instagram account. Friends and family had a great time applying turmeric paste on Oleg and Diipa. She kept her look for this function simple yet ethnic with just a touch of blush and pink lips, and floral jewellery in the form of bracelets, a ‘matha patti’ (forehead ornament) and a garland attached to her tresses. Her silky light brown Ritu Kumar ensemble with delicate gold thread embroidery paired well with Oleg’s white traditional Indian outfit. The color of her attire also matched the decor hues, especially the pavilion under which the couple sat during the ceremony. One ritual that still holds a special place in every North Indian/Punjabi bride’s heart is the 'chooda' (bridal bangles) ceremony. A few hours after Diipa's haldi function was the intimate ‘Chooda’ ceremony where the bride’s family and bridesmaids blessed her with bridal bangles moments before she was about to be married. Diipa looked ethereal in a Manik Jassal creation which included a maroon Dino Bustier with a deep neckline and Safari 2.0 skirt with floral motifs which she paired with a majestic choker from Amrapali Jewels. Her hair was tied back neatly, and she wore a simple bindi. Diipa’s handmade wedding gown was designed by Syrian designer Mohammad Ashi of Beirut-based Ashi Studio. She termed the ensemble an “art piece,” and it certainly looked like one. The creamy white canvas of the gown with broad ruffles at the hem was resplendent with exquisite floral embroidery inspired by Indian motifs. It was reported that creating the gown involved the work of 35 artisans and took around 1600 hours of craftsmanship to make. One dramatic element of the ensemble was the artfully draped veil with an embroidered border. 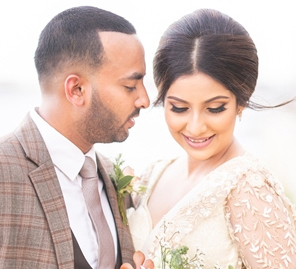 Diipa opted for an elegant low bun for the white wedding and kept her earrings simple so that nothing would take attention away from the stunning off-white sartorial masterpiece she wore to her white wedding. Later that evening, she changed into a custom-made white wedding gown designed by Pronovias. The couple had their first dance as husband and wife on a magical star lit night surrounded by their loved ones. For the wedding, Diipa wore a dark maroon lehenga by Sabyasachi. The skirt was resplendent with floral embroidery and included a dupatta with a broad border. Her jewellery for the big day included an ornate gold choker set, a ‘matha patti’ (forehead ornament), hand ornaments and a set of beautiful bangles. Her bridal makeup was all about youthful freshness. Diipa eschewed the glamorous look and opted for dewy skin and a light blush. She chose fragrances by Jo Malone London to give each room at the venue its own evocative, elegant scent. For the reception, Diipa pushed the fashion envelope in a dazzling Manik Jassal blue blouse paired with a ivory skirt. Later that night, she changed into a Faraz Manan ensemble that was modern and comfortable. She wore her hair in loose curls with a side parting and amped up the glamour quotient with the diamond jewellery. The groom complemented his ethereal bride in a classic Sabyasachi creation. Whimsical and romantic garden inspiration was the decor theme for this evening and the setup was brimming with interesting details as Diipa incorporated cute puppet animals and kaleerein in her reception dinner setup.